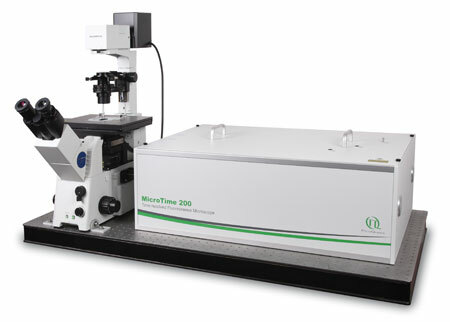 Fluorescence Correlation Spectroscopy (FCS) is a correlation analysis of temporal fluctuations of the fluorescence intensity. It offers insights into the photophysics that cause these characteristic fluorescence intensity fluctuations as well as diffusion behaviour and absolute concentrations of detected particles. 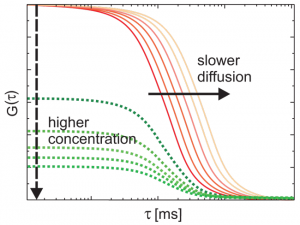 The most prominent and easily observed cause of fluorescence fluctuations is the fluctuation of the concentration of fluorescent particles (molecules) in the obeservation volume. The method records temporal changes in the fluorescence emission intensity caused by single fluorophores passing the detection volume. These intensity changes can be quantified in their strength and duration by temporally auto-correlating the recorded intensity signal, leading to the average number of fluorescent particles in the detction volume and their average diffusion time through the volume. Eventually, important biochemical parameters as the concentration and size or shape of the particle (molecule) or viscosity of the environment can be determined. FCS is a very sensitive analytical tool because it observes a small number of molecules (nanomolar to picomolar concentrations) in a small volume (fl). This concentration range fits to naturally occurring concentrations. Considering all the above, FCS is the perfect method to provide quantitative answers on diffusing molecules from within unperturbed compartments, like cells. Fluorescence (Cross-) Correlation Spectroscopy (FCCS) is the daughter technique and correlates signal originating from two different fluorophores detected in two channels with each other. When two spectrally different fluorophores are attached to two molecules, dual-color-FCCS results in information of the degree of coinciding appearance in the optical volume. Through this we can learn about the degree of interaction between the fluorophores. FCCS therefore offers access to binding kinetics at low molecular concentrations in solution as well as unperturbed systems like living cells. 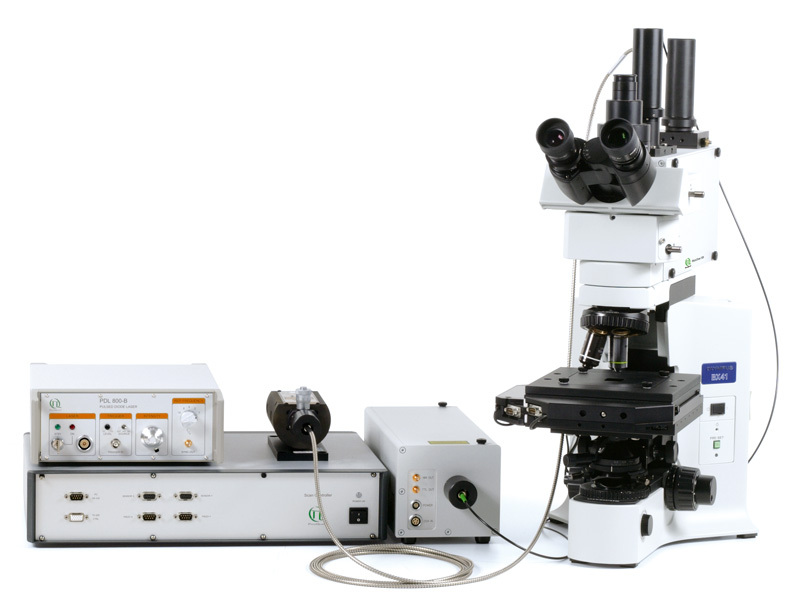 FCS can be performed with a continuous-wave laser, but using pulsed lasers allows even more sophisticated analysis possibilities like Fluorescence Lifetime Correlation Spectroscopy (FLCS) to elimate background or spectral crosstalk from the analysis. This is of paricaluar advantage when using spectrally inseperable fluorophores that differ in their life-time for FCCS. It also offers a way around afterpulsing artifacts. 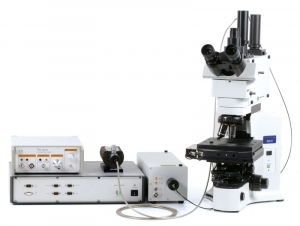 Since FCS-based-techniques measure fluctuations caused by single molecules entering or leaving the observation volume (or changing their fluorescence properties), a highly sensitive confocal microscope is a prerequisite for FCS experiments. 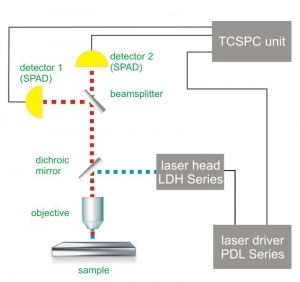 For a simple FCS experiment, a single laser and a single photon counting detector is needed. For FCCS, typically two lasers and two detectors are employed. Because FLCS builds on the additional information purveyed by the fluorescence decay characteristics, Time-Correlated Single Photon Counting (TCSPC) and its corresponding requirements like pulse lasers are necessary for FLCS experiments. water objective with high NA to reduce abberation and increase quantum yield. FCS allows to measure diffusion rates that are typically expressed as the diffusion coefficient of the molecule or molecular complex. FCS is even capable to detect and distinguish between single and multiple component diffusion. Furthermore, this technique enables the investigation of lateral and rotational diffusion of fluorophores as well as conformational dynamics providing e.g. information about hydrodynamic radii and singlet-triplet dynamics. In addition, FCS provides a direct and independent, calibration-free measure of molecular concentration within a sample. Based on the concentration measurement and cross-correlation between two fluorophores (dual-color FCCS), data are used to detect molecular association and dissociation and to determine the stoichiometry of molecular complexes. In this way, it is possible to determine kinetic rate constants, i.e. 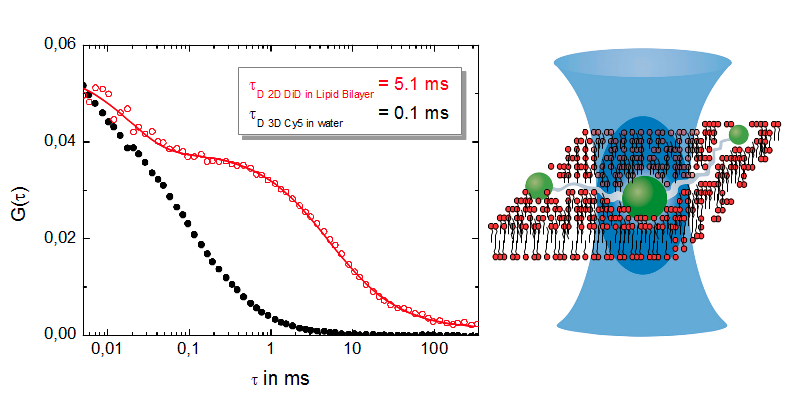 on and off kinetics of complex formation, as well as enzyme dynamics and intramolecular dynamics in vitro and in living cells. Ago2, an argonaut protein, is part of the RNA-Induced Silencing Complex (RISC). Understanding the localization and assembly mechanism of RISC helps to unveil the regulation of gene expression. The mobility of GFP-Ago2 was measured in ER293 cells in the nucleus (red cross in left figure) and the cytoplasm (blue cross in left figure). The corrsponding FCS curves are shown in the middle figure. 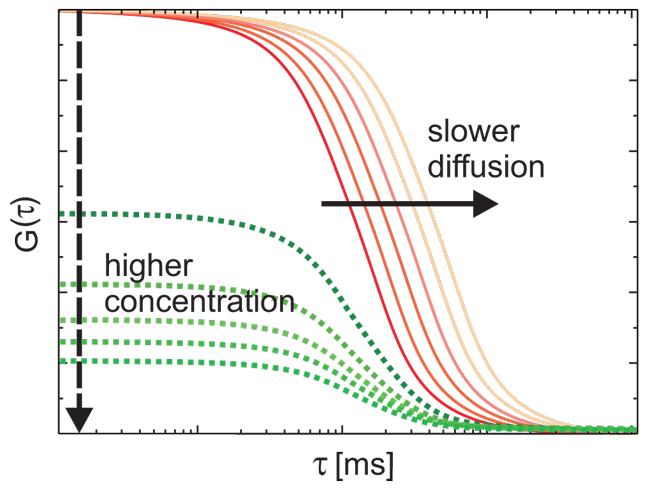 Measuring the diffusion coefficient inside the nucleus (about 13.7 µm/cm2) and in the cytosol (approx. 5.4 µm/cm2) revealed that RISCs complexes differ in their diffusion behaviour, which was confirmed to be due to size differences of nuclear and cytosolic RISCs (right figure). Many molecules ranging from small aromatics to large biomolecules like proteins can be detected by their intrinsic fluorescence in the deep UV as they contain appropriate chromophoric groups such as tryptophan and tyrosine. 266 nm excitation grants access to the intrinsic fluorescence of tryptophan-containing proteins. This proof of principle experiment demonstrates that with the specially adapted MicroTime 200, FCS measurements are possible even in the UV. Different laser dyes and for comparison streptavidin coated beads were excited at 266 nm. Fluorescence was detected at wavelengths above 300 nm.